Galicia is a very special region in Spain: a place of leyendas (legends), brujas (witches) and almas en pena (lost souls); a climate closer to Britain than Spain; hard-working people who have had to emigrate throughout history; a land full of mountains, sounds from the sea and gaitas (bagpipes) and protected by the apostle Santiago (St. James). Because of all these peculiarities, we say that los gallegos (Galician people) have a special feeling: la morriña (homesickness). Another cliché of them is very funny: we say that los gallegos always answer a question using another question. All of this is part of their idiosyncrasy. However, today we’ll learn more about their variety of Spanish language. If you want to know more about other regions in Spain, click on these links: Sevilla, Barcelona y País Vasco. The entonation is very perceptible: it’s very soft. Some reductions in groups of consonants like ct, gn… Ex: Correcto = /korretu/; Resignación = /resinacion/. They don’t use the pretérito perfecto compuesto tense (he hablado = I’ve spoken). They use the pretérito indefinido tense (hablé = I spoke) for all complete past actions. Ex: Hoy hablé con mis amigos, instead of hoy he hablado con mis amigos. In the first person of the pretérito pluscuamperfecto de indicativo (había hablado = I had spoken), they prefer the pretérito imperfecto de subjuntivo (hablara). Ex: Cuando llegaste, ya hablara yo con mi amigo (when you arrived, I had already spoken to my friend). Constant use of some diminutive endings: -iño, -iña, -ino, -ina. Ex: ¡Ven aquí, rapaciño! (Come here, little kid!). Rapaciño comes from rapaz (kid). In spite of these variations, an upper-intermediate Spanish student will be able to have a conversation with a Galician person with no problems. ¿Y si vienes a Galicia este año? (How about going to Galicia this year?). You can learn Spanish via Skype with us before coming. Reserve a free trial lesson here. 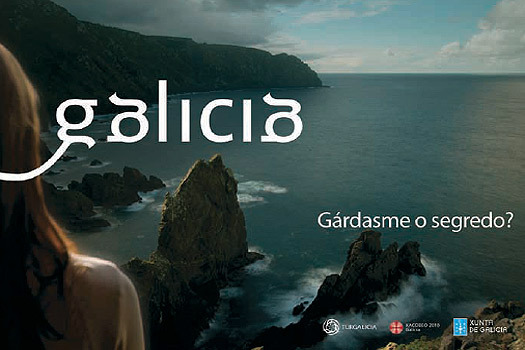 We guarantee that, if you come to Galicia, no tendrás morriña (you won’t feel homesickness).